Welcome to the latest in an ongoing tribute to the art of the calavera. We have been focusing on the master of the form, José Posada. As I say each week… His rapier visual wit and penchant for the visual metaphor of the human bone remain stunningly fresh today. He was, at one time, just an apprentice, though. To whom? The master to the student in Posada… Manuel Alfonso Manilla . Let’s pay tribute this week to one of Manilla’s proto-calavera works. Stunning. In 2012, we lost one of the greats, the ever-imaginative Ray Bradbury. Bradbury’s stories range from the truly heartwarming to the hauntingly horrific and it is this intersection that makes his work as emotionally resonant as it is imaginative or terrifying to us. I’m, of course, focused on the author’s horror work on this blog and what a body of work it was. From “Something Wicked This Way Comes” to “Autumn’s People” to “Zero Hour” to “Small Assassin” and SO MANY others, he gave us some of the most enduring and heart-pounding images of youth. It came on great oiled, resilient, striding legs. It towered thirty feet above half of the trees, a great evil god, folding its delicate watchmaker’s claws close to its oily reptilian chest. Each lower leg was a piston, a thousand pounds of white bone, sunk in thick ropes of muscle, sheathed over in a gleam of pebbled skin like the mail of a terrible warrior. How tall they stood to the sun. In the last few months it seemed the sun had passed a hand above their heads, beckoned, and they were warm metal drawn melting upward; they were golden taffy pulled by an immense gravity to the sky, thirteen, fourteen years old, looking down upon Willie, smiling, but already beginning to neglect him. An early summer camp experience I had was my formal introduction to Mr. Bradbury’s work when a camp counselor would read a story each night to the dimly lit cabin from Ray’s shorter pieces after “lights out.” Perhaps the greatest compliment that can be paid to those short stories was that they held a VERY squirrely group of pre-pubescent boys TOTALLY rapt in the quiet darkness of those warm summer nights. We would actually beg for the stories each night. One of the stories that we heard was the Bradbury masterwork of tension, “The Ravine.” The story was also featured on the first episode of a brilliantly produced radio series featuring Bradbury’s work called “Bradbury 13.” YouTube user “The Edge of Nightfall” has posted episodes from the series. I will be sharing some of the horror pieces here in tribute to the master’s work. LITERATURE :: “FRANKENSTEIN” COMES ALIVE! All apologies to Mr. Frampton and Colin Clive on that headline. For lovers of great horror, this is really cool news. Mary Shelley’s original, groundbreaking manuscript for her gothic masterpiece “Frankenstein” is now online. The New York Public Library, The University of Maryland’s Institute for Technology in the Humanities and Oxford’s Bodleian Library (among other institutions) have banded together to bring this to life as part of the Shelley-Goodwin Archive. Not only is it fascinating to see the story in Shelley’s own hand, it’s really captivating to see so directly the collaboration between Mary and Percy (the literary giant that was her husband) that comes through in these pages. Amazing stuff! ANNNND… Sooooooo cool that they chose Halloween as a launch date! Big ups on that one. Author David Edward JohnsonPosted on November 1, 2013 November 2, 2013 Categories Literature, TributesLeave a comment on LITERATURE :: “FRANKENSTEIN” COMES ALIVE! 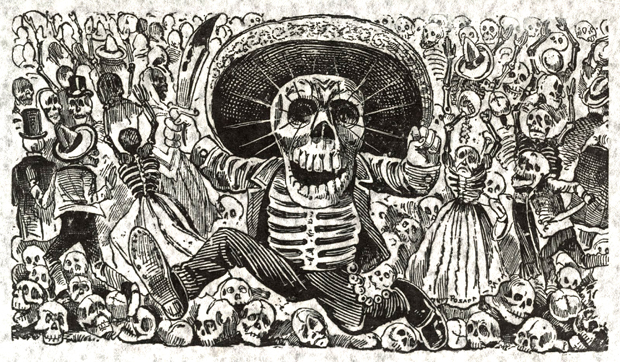 Welcome to the latest in an ongoing tribute to the master of the calavera, José Posada. His rapier visual wit and penchant for the visual metaphor of the human bone remain stunningly fresh today. Sadly, he died penniless and was buried in an unmarked grave. May this series serve as that lasting nod to his incredible legacy. So much credit has been given to The Misfits over the years, that another band, equally important and also formed in the same period, is often overlooked for its contribution to the horror rock genre. There is absolutely no question that The Misfits were founding fathers of the “Horror Punk” scene as I detail in Part III of this series. But let’s take a moment to pay homage to a early progenitor of the “Psychobilly” scene who brought the horror in a highly influential way that puts them firmly as the other bookend to this four part series :: The Cramps. Formed in the mid-1970’s (before The Misfits, actually) in Sacramento, California by Lux Interior (born Erick Lee Purkhiser) and Poison Ivy (born Kristy Marlana Wallace), The Cramps quickly relocated to find a home along side of legendary acts like The Ramones, Patti Smith and Television at iconic New York clubs like CBGB’s and Max’s Kansas City. The Cramps struck their own profile among the emergent punk / alt scene, living at the intersection of trashy Americana, sexual fetishism and cheap, horror B-movie clichés. The result was a devilishly clever mix of humor and shock. The shuddering, strutting, cross-dressing Lux Interior cut the aspect of the perfect front man, backed by Ivy’s guitar, an important female icon on the early alt scene. These elements, coupled with songs like “I Was a Teenage Werewolf,” “Zombie Dance,” “Human Fly,” “Aloha from Hell,” and “Surfin’ Dead” and imagery surrounding the band straight out of teenage horror film classics all added up to a potent cocktail of horror rock power. As a creative professional with a focus on design and as someone who has ever-harbored a deep love for the trashier side of Americana, this collective image remains captivating today as much as it was when it was hatched. Though the band changed personnel over a long career, they never lost sight of their image. Look at these image materials as well. I am lucky enough to have the Alan Forbes piece featuring The Bride of Frankenstein (with the whip) shown below as a part of my personal art collection. I keep it in my office as a reminder to bring disruption to my creativity in the way The Cramps did. Horror fans, join me and pay tribute to the glorious trash brilliance of The Cramps! This also brings to a close my exploration of the founders of the horror rock genre. All of these artists are true mavericks who remain vital today. My hope is that you will explore each of them beyond this introduction. Turn it up and feel the chill! The Misfits. One of the true pillars of the horror rock genre. Many consider them the progenitors of the genre, though they were definitely preceded by Screamin’ Jay Hawkins and Alice Cooper as we have explored. But this in NO WAY detracts from their contribution to the scene. Though those artists may have led the way, The Misfits MADE the scene in many ways. Their fusion of the dark themes of horror and the nihilistic punch of punk is a match made in heaven that still seems progressively retro today. Formed in 1977 in New Jersey by Glenn Danzig, The Misfits took what was happening in the American punk scene and brought their love of horror to it, creating a theatrical approach that made them unique among their early peers. Their image was built with a mix of makeup, memorable hair, great branding and horror imagery surrounding them. The songs formed the bedrock for this image though, leveraging grade B horror themes. Titles like “Vampira,” “Halloween,” “London Dungeon,” “Horror Business,” and “Night of the Living Dead” and a self-formed label named “Plan 9 Records” for the Ed Wood sci-fi horror classic “Plan 9 From Outer Space” showed this love for the genre at large. How can you follow Screamin’ Jay Hawkins? Really, there’s only one cat cool enough to take the stage RIGHT after… The great Alice Cooper. Neé Vincent Damon Furnier, in Detroit Michigan in 1948, this artist took the beginnings of horror rock from Screamin’ Jay and opened the doors wide. Throughout his six decades in the music business, Alice Cooper has done an incalculable service for horror rockers and for the horror genre itself. With a stage show that includes guillotines, prop blood, real boa constrictors, electric chairs, MORE prop blood and baby dolls, how could we not pay homage to this man? Rolling Stone has referred to him as “the world’s most beloved heavy metal entertainer” and I have to agree. Check this out. Still awe-inspiring after decades! A legendary image built on horror. For all of these years, you have continued to entertain and shock us, Mr. Cooper. A boa’s embrace for all of the chills. Horror rock: Talk about a sub genre. I thought I would expand on my recent Bauhaus tribute and do a short series featuring the artists at the very roots of horror rock. Really, there’s no better place to start than the inimitable Screamin’ Jay Hawkins. Hawkins, neé Jalacy Hawkins, was born in Cleveland in 1929. Though many may credit other sources as the wellspring of horror rock, Screamin’ Jay is it. This is the bedrock. In the legendary recording session for this song, the band was roaring drunk and Hawkins was literally blacked out when he laid down the track. The result was a guttural, grunting masterpiece that, while banned on many radio outlets of the day, surpassed a million copies in sales. Soon after, proto-rock-DJ Alan Freed paid Hawkins $300.00 to emerge from a coffin to kick off a live performance and the great tradition of dark horror rock props was born. Hawkins soon added foppish costumes and several other horror-driven elements to his shows including “Henry,” a smoking skull character that accompanied him wherever he appeared. in many ways, he embodied the idea of a cartoonish, black Vincent Price. It all starts here, folks. Represent for Screamin’ Jay. Turn it up! As a young lad, I spent many hours in the dark and arcane environs of the Titus Avenue location of Rochester, New York’s Empire Comics. When I wasn’t in the arcade, I was drawn to the horror comics in the stacks, trying to pull together what money I had to take what I could home with me. Among the most prized issues I did manage to bring home were the early issues of DC’s “Swamp Thing” and a new comic I had purchased; the first issue of “Berni Wrightson, Master of the Macabre.” I was absolutely taken with the style of the art. Incredible brush work and absolutely STUNNING pen and ink pieces soared on the pages within. The perspective was always fascinating and the tension within the illustrations was unmatched. It kept me poring over those pages again and again. I must have read those hundreds of times. The self-titled comic gathered stories from Wrightson’s past — work for “Eerie Magazine,” the legendary horror comic anthology. Look at these panels from “The Pepper Lake Monster.” The detail in the ink work and the perspective are simply amazing. As a fan of cryptozoology as well, I was in hog heaven when I saw this piece. For Christmas that year, my parents got me “Creepshow,” the graphic novel. Wrightson at the helm again and for a young lad with dreams of being an artist and more than his fair share of a love of horror, I was completely in love. I remain in love to this day, only moreso as I understand more the true genius of his unique talent. I credit this early exposure as a direct inspiration for my career in the arts as a graphic designer. On my best day, I don’t even have a thimbleful of Mr. Wrightson’s talent, but he drove me to dream. From early work for DC’s horror comic “House of Secrets,” through the game changing “Swamp Thing,” to “Eerie,” “Frankenstein” and the myriad other projects throughout a long and storied career, I personally want to nominate Bernie Wrightson (changed to “Berni” for some work to eliminate confusion with a US diver of the same name) to the great (yet to be built) Horror Hall of Fame. Thank you, Bernie, for the years of art, inspiration and chills. Those who say that comics aren’t “real art” clearly haven’t seen your work. Though many bands may have darker, more overt horror-driven themes, I don’t think ANY have captured the essence of a gothic sense of horror better than Bauhaus. From the angular, vampire’s strut and croon of Peter Murphy to the dark and often sparse artistic vistas of their instrumentation to the gothic thematics of their lyrics, it’s all here and it’s all awesome. Who can forget the band’s inclusion in Tony Scott’s lush vampire masterpiece “The Hunger?” An incredible example of the band’s power and one of my fave credit sequences of the era. Honestly, that legendary song, “Bela Lugosi’s Dead,” would be enough to earn them a permanent place in the annals of horrordom, but it was the total package here that carried so much appeal. All of it. So gorgeous, so gothic with that dark sense of foreboding communicated in only the best works of horror of any kind. I know the band might sigh at a tribute on a dark blog like this as so much of their output was about love and more hopeful themes (and I loved that work as well), but they have given lovers of the gothic a body of work that stands alone in so many ways. My only hope is that the youth of today will look back occasionally to see a band like Bauhaus for what it has given to shape the music of today’s dark edge.